DiRRiD has been part of the SPECTRA program of Santa Cruz County's Cultural Council since 1998. School performances and residencies in rhythm and dance education in area public schools have been enthusiastically received. 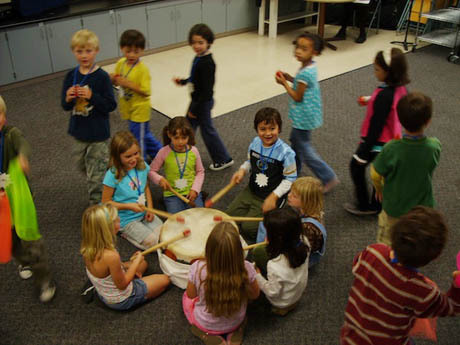 Heidrun works with children in a hands-on setting around a large “mother drum,” clapping, stepping, singing, and drumming together. The emphasis is placed on simple rhythm concepts: slow/fast, loud/soft, and listening to one another while playing together, developing dances that sound and turn into rhythmical music. The Body Oracle Cards™ are used as an attention-focussing aid, and help students learn about and differentiate between parts of the body and types of movement. Children enjoy using the cards. It fosters an element of group process, contrasting the teacher-centered approach to learning something new. An added benefit of using the Body Oracle Cards is that they open the doors for six different languages. 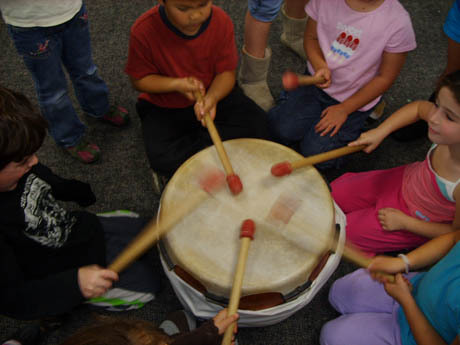 Working with children around a central drum provides an opportunity for teaching in a style that balances structure and freedom. The children are encouraged to push back their desks and learn to express themselves physically and artistically in ways that may not be typical in conventional classrooms. In addition, teachers are given experience—and perhaps new insight—into ways to augment their teaching style with structured freedom, playfulness, individual self-expression, and energy release. If you would like to have your group experience DiRRiD or to request DiRRiD in your school please contact info@dirrid.com. Click on photos to enlarge. Double-click to shrink.